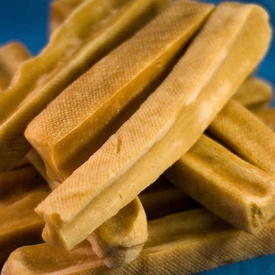 Treat your dog to the unique and tasty Himalayan Dog Chew cheese treats! Completely safe for dogs to chew and ingest, the Himalayan Dog Chew cheese treats are delightful and nutritious rewards that your pet will enjoy every day. These premium smoked and pressed cheese dog treats are handcrafted with lactose-free yak and cow milk from co-ops in the Himalayas (Eastern Nepal and the mountains of West Bengal in India), which help support the local communities in the area and the farmers who raise yaks and cows. The yaks and cows are free-range, grazing on open grasslands, and are never treated with antibiotics or hormones. Long-lasting and satisfying, these hard cheese chews for dogs are high-protein and low-fat and 100% digestible. For leftover parts of the chew, you can even microwave them and make cheese puffs for your dog! This listing is for Himalayan Dog Chews for Dogs Under 55 lbs. (25kg), and these dog chews are for dogs 12 weeks or older. You can find Himalayan Dog Chews for other dog sizes sold separately here at Lucky Pet. Make treat time extra cheesy and satisfying with the Himalayan Dog Chew! What size of Himalayan Dog Chew do you recommend I give to my dog? Small (blue bag) is recommended for dogs under 15 lbs. Medium (green bag) is recommended for dogs under 35 lbs. Large (red bag) is recommended for dogs under 55 lbs. XL (gray bag) is recommended for dogs under 70 lbs. Big dog (red vertical bag - limited avail.) is recommended for dogs over 70 lbs. Mixed bag (yellow bag) is recommended for dogs under 65 lbs. Going up in size is never an issue and is completely appropriate; however, we do not recommend giving your dog a smaller size than the recommended weight classification as this can cause potential choking or blockage issues. If your dog has a larger mouth and jaw (example, Pit Bull) or is a voracious chewer then it is recommended to size up. If it appears as though your dog is going to swallow the entire product or a large piece at any time, then it should be taken away and can be reintroduced at a later time if appropriate. In fact, they would recommend that all dogs be supervised at all times after being given any toy or treat not just the Himalayan Dog chews. With all this being said, we do understand that there will always be some dogs that will be unable to tolerate these chews. In some cases stomachs may be very sensitive to lactose even though there is a negligible amount remaining, just as humans are. Ultimately, owners are very aware of their own dogs’ limitations with different types of food and we recommend discontinuing use if you feel there is an intolerance or issue and recommend trying one of our other many treats and chews. Other potential hazards that could arise may include but are not limited to: choking, indigestion, blockage and breakage of teeth. Please use your best judgment when deciding if this product is right for your dog and always supervise your dog during consumption and remove immediately if any concerning factors arise. What if my dog swallows a large piece of Himalayan Dog Chew or sharp pieces? Most dogs when swallowing pieces of the Himalayan Dog Chew, digest these pieces and expel them, however, if the piece of chew is too large, this could result in vomiting up the piece or causing a potential blockage as the piece will not have enough time in the digestive system to be able to break down fully before it needs to be expelled one way or the other. Non concerning pieces are generally small being the size of a dime or smaller and the company has yet to hear about any issues with sharp pieces causing issues. This also varies however due to the size of the dog vs. the size of the chew. A Great Dane will be able to pass a much larger piece than a teacup Chihuahua would. If you feel this may be a life threatening or serious issue, please contact your veterinarian immediately. We always recommend monitoring your dog for changes in behavior including but not limited to: listlessness, vomiting, lack of eating or drinking and lack of bowel movements. We recommend doing what you feel is best for your dog being monitoring your dog or consulting with your veterinarian. With all this being said, the amount of instances seen with serious injuries have been very minimal and have always been the result of an extremely large piece swallowed which is never recommended. Even a single dog that is injured is too many in our eyes so please notify us if you have an issue or concern or comment and please retain as much information as you can including: size of chew purchased, lot number on the bag, where purchased, specifics of the concern, etc. As safety and quality are our top priorities, we rely on this information to help us evaluate our products, packaging, etc. and getting this information from you, the customer, is the best source to help us identify issues and updates. What are the salt, fat and calorie content of your Himalayan Dog Chews? The sodium content in the Himalayan Dog Chews is .02%. It is used as a flavor enhancer, not for the flavor itself. How should I store my Himalayan Dog Chew after opening? After opening your Himalayan Dog Chew, store it in a cool dry place. If the chew sits in moisture or is resealed in a bag for more than an hour then this can cause the cheese to mold. Himalayan Pet Supply recommends placing it on a counter or in a cupboard and allow it to air dry. Refrigerating is not recommended as this will result in moisture loss and will cause the chew to crack and become brittle. What do you mean by microwaving the end piece? The Himalayan Dog Chews are great because there is minimal waste to them. When your dog chews the chew down to a small "end nub" piece where you would normally toss it due to potential choking or swallowing hazards, you can pop it in the microwave for 45-60 seconds (based on an 1100 watt microwave - add 10 second increments if not fully puffed) and it will puff up into a crunchy cheese puff treat that the company calls yakyPUFFS. Just place the piece in the microwave (NOT recommended to put on a paper towel), puff up, let it cool for 2 minutes and your dog will have a new exciting treat to enjoy! What is the expiration date of your Himalayan Dog Chews and how do I know if it is still good? Himalayan Dog Chews have a best buy date of five years. Although Himalayan Dog Chews rarely go bad, if you see fibrous light white or greenish blue spots on the chew please discontinue use and contact us by email or phone and please have this information retained: size of chew purchased, Lot number (starts with an L and ends in four numbers)and where this was purchased. This is a sign of mold growth which is a natural side effect of these chews. Please retain the chew in a sealed bag and we will guide you on what to do with it. In turn we will certainly send you a replacement chew. How do I read the code on the package? The Himalayan Pet Supply company is currently moving to a best buy date code on Himalayan Dog Chews and other products, however, if you receive a package that has a code which looks like a date (ex. 1236515) this is a Julian date code and is the production or manufacturing date of this product. In the example the 12 = month, the 365 = 365th day of the year, and the 15 = year. In short this chew would have been produced on December 31st 2015. The Himalayan Dog Chews have a best buy date of five years so this chew would be best buy December 31st 2020. What does the FDA say about bones for dogs? The Himalayan Dog Chews are not made of bone but cheese. However, the chews are hard and can have properties similar to a bone which is why the company discloses the FDA’s recommendation on bones. Please visit: http://www.fda.gov/ForConsumers/ConsumerUpdates/ucm208365.htm for more information regarding the FDA’s recommendations on bones for dogs. If you have questions about their other products please email customerservice@himalayandogchew or call us at 425-322-4295 or toll free at 1-855-414-5153.